The beginning of the week might be a bit boring, but not for Powerpuff girls. They turn their activity into the adventure, but you can take participation. Press buttons in the right time and win the challenge. 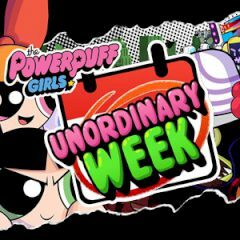 This week will be memorable for the Powerpuff girls. Your adventure starts from Monday, where you have to defeat a huge robot with your bare hands. It's a huge metal device, that forgives no mistakes. However, you still have enough power to disable it. Press defend and attack buttons in time and deal damage to it!